I am trying to write up the family history of the Lowe family and would like to identify the people in the photograph. These are the basic facts to the best of my knowledge. Charles William Lowe was born 21st October 1867 at 13 North St, Portslade. His death certificate says he was a ‘Sausage Skin Manufacturer’s Dresser’. His father was William Lowe born 1841 Enfield, Middlesex 1841. Died Brighton 1884. Sometimes described as a hairdresser. Sometimes as a watchmaker. His mother was Mary Simmons 1841-1884. Charles William Lowe married Charlotte Ann Potter 10 October 1889 at Brighton Register Office. He died 13th February 1915 at 122, Ditchling Rd, Portslade. 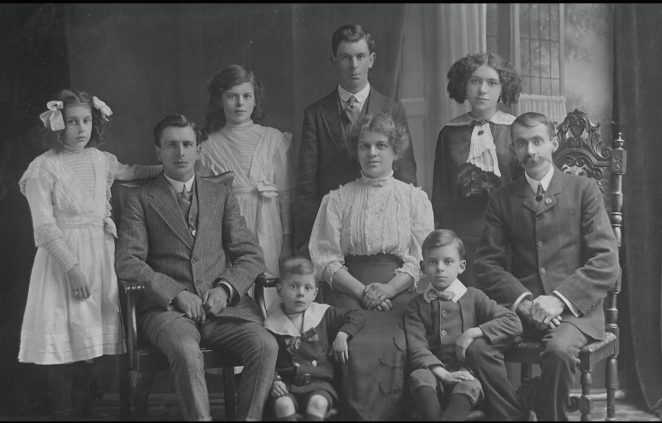 There were eight known children of the marriage, some are shown in the photograph below. I would be grateful for any help with this photograph or any other information on this family. This is a photo of the family of Charles William Lowe taken in Brighton around 1912. Click on the photograph to open a large version in a new window. It may not be relevant, but a lovely Mr and Mrs Lowe lived at 168 Springfield Road, Brighton in the 1950s and after Mr Lowe died, Mrs. Lowe continued to live there in the 1960s. They were a lovely gentle couple, very friendly, and we lived next door. He had served in WW1 and was a blind veteran from that conflict. Thank you for your reply, Mary. My husband does not know of any relatives in Springfield Road but we will see if anyone else in the family has any recollection of the couple you have mentioned. I never knew any of the Lowe family but I absolutely love this fine photo from so long ago. What I find intereresting is the definitive family likeness running through the parents and the children through the eyes and the facial features. Fascinating. Mike Peirson. Jean – I am afraid I cannot help directly with the photograph, but my great grandmother – Ada Lowe – born in 1874 is Charles William’s half sister. Her father was Charles, but her mother was Ruth (nee Belcher) who he married in 1873. It is certainly the same Charles (Enfield, watchmaker from the 1881 census when Ada is one of three children living with Ruth and Charles), but obviously if Mary (nee Simmons) died only in 1881, it does not fit entirely comfortably. Charles William in 1881 seems to be living with his aunt and uncle (the aunt seems to be Charles’ sister). You may have more of a grip on this than I do! Jonathan- thank you for your comments. I hadn’t noticed that the death date for Mary Simmons was wrongly entered. I believe she died in 1872 and Ruth Belcher then married Charles’s father. The rest of your information is also correct. I know Ruth remarried after William Lowe’s death -a George Linfield I think. Editor’s Note: we no longer publish requests for information on third parties as the sharing of information without their permission breaches their privacy.